June 2018 saw 1,076 Kona EV units sold in its domestic market, and 1,120 exported deliveries. The monthly numbers will increase only a little from here, but Hyundai is only planning for 30,000 units per year in the near term. Most of the exports are currently going to Europe, and won’t be arriving in the US till later in 2018. Whilst the Kona has a number of standout features in terms of safety and driver assistance (including a heads-up display option), connectivity, and more, the real differentiation is in the 64 kWh version’s range and charging capability, hitherto unseen at this price point, making the 64 kWh Kona a true all-around winner. Pricing for the long-range, 64 kWh version varies by market, but starts from around €34,000/US$40,000 equivalent in Norway (NKR 326,000), €39,000 in Germany, £36,000 in the UK, or €42,000 in France. US pricing will emerge towards the end of 2018. Incentives in some markets will effectively reduce these prices further. In Norway, at this price, the 64 kWh Kona is a similar cost to the Bolt/Ampera-e. This is also in the likely price area of the Tesla Model 3 standard range once driver assist (Autopilot) options are added. You’ll have to wait a good 6 months or so for that Model 3, but when it arrives, monthly production numbers will be approaching 10× the Kona’s numbers. What’s special about the 64 kWh Kona’s range and charging? The EPA combined range is indicated to be 250 miles (402 km), a little better than the Ampera-e (238 miles, 383 km), which was the past range leader at this price point. For now, the EPA has not provided an official highway range rating for the Kona 64 kWh, but we can safely assume the figure will scale to a similar % of EPA combined range as the Bolt’s does. The two EVs are similar in size, weight, and aero performance. We work here with an estimated figure of 225 miles EPA highway range (slightly conservative, with the final figure perhaps being 1–2% higher). What makes the Kona even more outstanding is the charging speed. Thanks in part to well designed liquid cooling, the Kona’s 64 kWh battery can accept charging power at up to 80 kW, which is previously unheard of at this price point, being 70% more than the Bolt/Ampera-e. The latter charges at a maximum of 47 kW and starts to taper at around 52% (see chart data). Overall, the Bolt/Ampera-e takes 63 minutes to recharge from 10% to 80%. 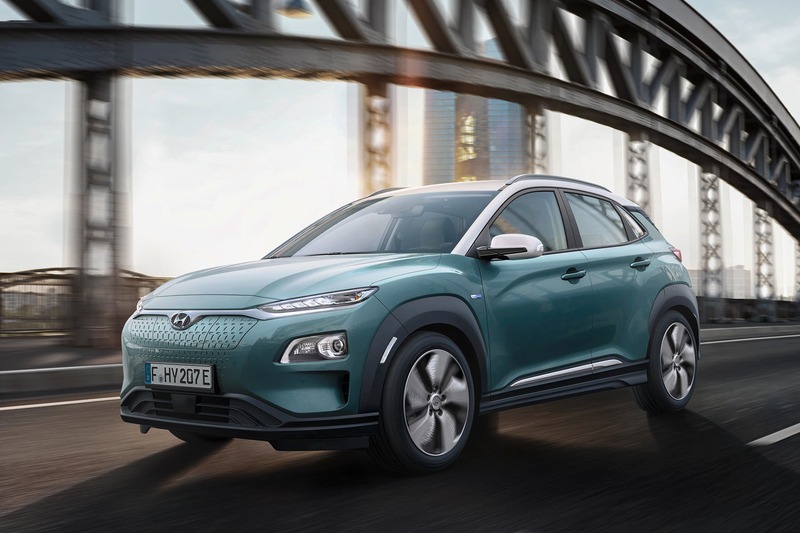 Statistically significant real-world data on the Kona’s charge performance will take a while to emerge, but — based on experience of the outstanding charge performance of it’s older sibling, the Ioniq — we can expect outstanding performance. The Ioniq is already capable of charging at up to 68.5 kW peak, and averaging 65 kW over a wide charging window. In-depth interviews with the Kona’s designers suggest that the Kona is capable of 80 kW peak charging. 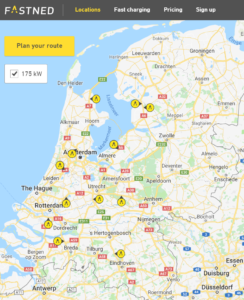 The EV charging experts at Fastned also expect 80 peak kW charging (see the webpage screenshot above). 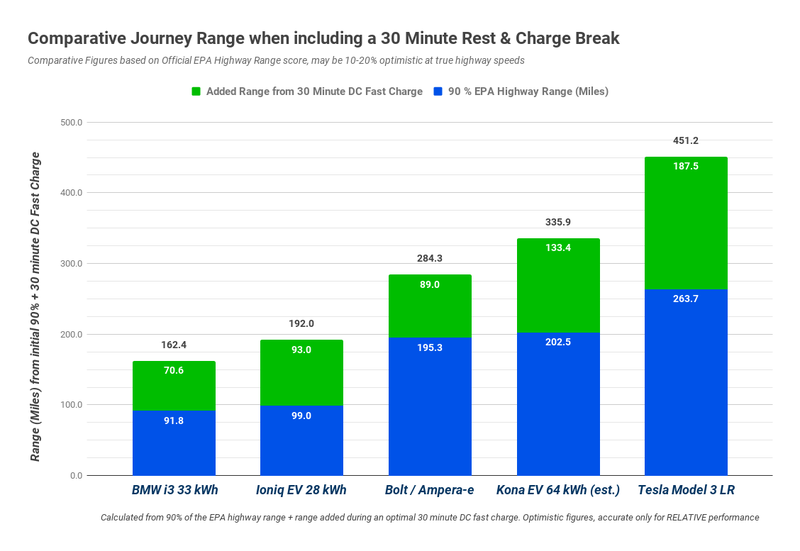 If that’s the case, then a typical 10–80% mid-trip recharge on optimal charging equipment could be completed in around 36 minutes and 20 seconds for the Kona, at a 74 kW average charge rate. If there’s tapering beyond 60–70%, it will be a few minutes slower but still out perform most of its peers. Note that whilst the figures on the chart do accurately reflect the relative range and charging performance of the EVs included, the EPA highway rating is optimistic, based on moderate-speed highway driving of the kind that most folks, other than your zen granny, will rarely follow unless traffic is backed up. For real-world highway driving speeds at (or occasionally exceeding) posted limits of 70+ mph, expect range figures 10–20% lower than this, dependent on your actual speed and environmental conditions as well as the vehicle itself. The chart figures also assume that you use the optimal charging equipment, capable of delivering the max charge power each car is designed to receive. This equipment is not always commonly found outside of some areas of Europe, but it is rolling out as we speak. The important point is that the comparative performance capability between the models is a fair measure of what they can do if you give them their best shot. The Model 3 Long Range is not a peer of the Kona, being considerably more expensive, but it is included in the chart to serve as a well known reference point. Notice that, even compared to the Tesla, the Kona gives a fairly decent performance in terms of range and charging capability, especially considering the price differential. We can revisit this comparative chart when we have Model 3 Standard Range data available. Things are heating up in the EV space. For folks looking for a small SUV form factor, for both daily driving and the occasional road trip, the Kona fits the bill very nicely, and at a competitive price point. The only challenge will be getting hold of one, given the planned production volumes mentioned above. If the Hyundai Kona looks good to you, get your order in early!